A few months ago, I had the most amazing and surprising salad from Ten Tables. Fresh radicchio, simply dressed, and served atop a rich lemon panna cotta. Huh? Isn't panna cotta dessert? Yes, it has a light creaminess that also works well against the slight spicy, bitterness of radicchio. 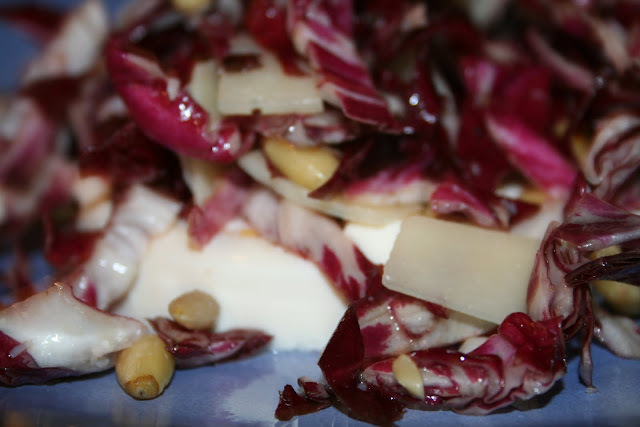 When I found radicchio at my local farmers' market, I had to give it a whirl. Having been a few months since I had tasted this treat, I couldn't remember the cheese and nuts that were mixed in the salad. Since both radicchio and panna cotta are staples in Italian cooking, I went with a smooth, nutty piave and sweet roasted pine nuts to balance the whole meal. Hint: Do yourself a favor and make the panna cotta the day before. It keeps just fine for a few days and if you don't use it for this, you can always top it with fresh berries for a light dessert. Warm the half and half, sugar, and lemon zest over medium heat until the sugar dissolves. Meanwhile, hydrate the gelatin in a few tablespoons of cold water. Mix the lemon juice from half the lemon into the gelatin. Whisk the gelatin mixture into the cream mixture. Pour into two lightly greased small containers (I used the pint tubs that you get olives and stuff in from Whole Foods). Allow to solidify in the fridge. In salad bowl, mix the olive oil, remaining lemon juice, grated cheese, and salt and pepper. 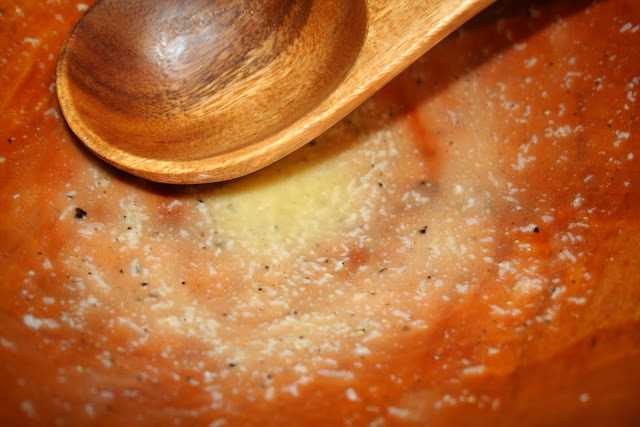 The cheese will help is make a more saucy dressing. 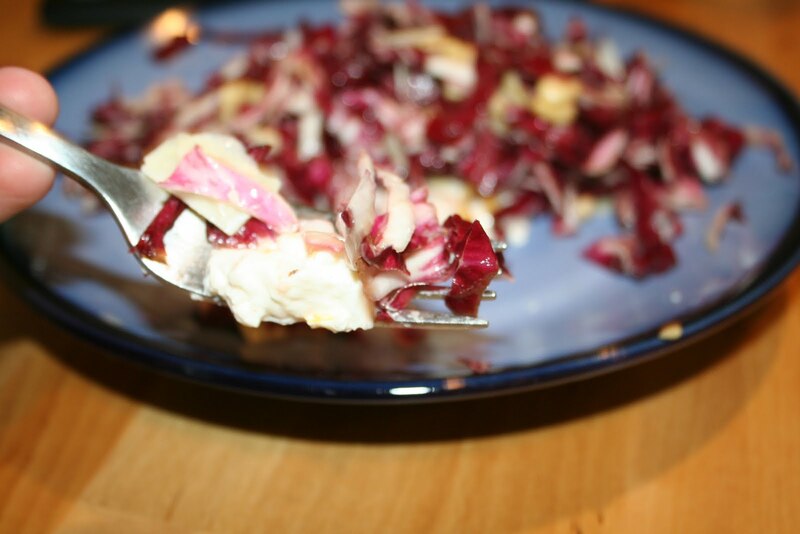 Slice the radicchio into cole slaw-sized slivers. And shave the piave. 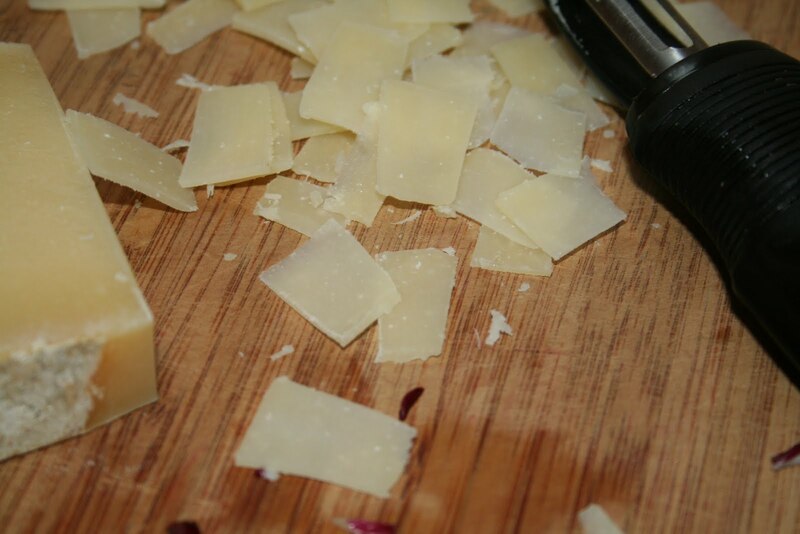 One helpful hint I learned from Giada, is to use a vegetable peeler to shave cheese. Works like a charm. Try to ease the panna cotta onto a salad plate. You can kinda see that I didn't have the best of luck with that. But just get it basically back together and don't stress too much about how it looks since it's going to be covered up anyway. 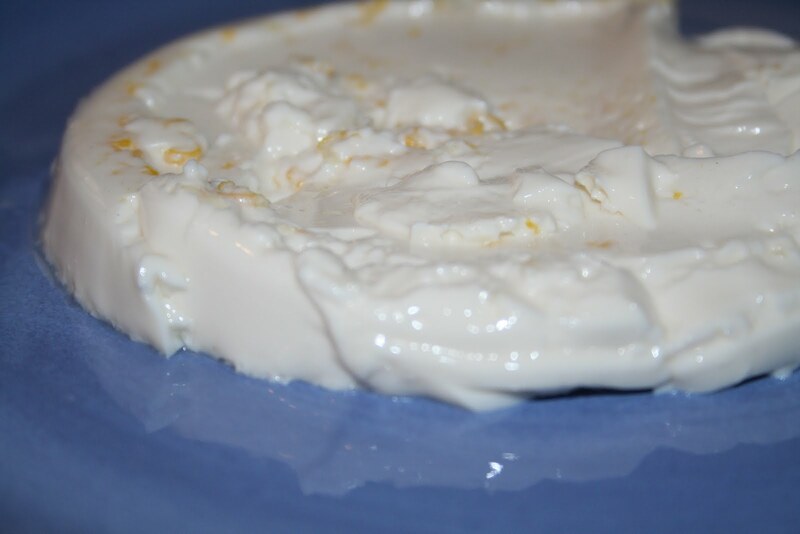 Toss the rest of the ingredients in the dressing and serve on top of the panna cotta. It can be a bit of a challenge, but try to get the perfect bite that includes a little bit of all the ingredients. It's worth the effort.